Of course, anyone serious enough about discussing the consequences of such police incompetence could easily point out the extreme damage it causes to the communities they affect, often exacerbating the very dangers allegedly been combated. But again, this is too obvious a point for serious commentators to linger on. On 8th April 2009, 12 students (of whom 11 were Pakistani nationals) were arrested with great fanfare in the Greater Manchester area. A “big plot” had been foiled, announced Gordon Brown gravely on the very first day, presumably in case people were intending to wait for such insignificant trivia as ‘facts’ and ‘evidence’ before passing judgement. Unsurprisingly, all were released within thirteen days, without charge and without any apologies or, indeed any signs of humility from those in charge of the operation. Instead, to the injury of having their lives ruined and their reputations damaged beyond repair was added the insult of being unceremoniously dumped, head first, onto the deportation convoy. How the ‘evidence’ against the men was insufficient to charge them with as much as an ASBO but enough to declare them to be serious threats to our ‘national security’ was an absurdity too obvious for many media outlets to notice. Instead, we saw a hurried re-heating of the ‘you can’t be too safe’ litanies. Once again, the commentaries’ reaction was predictably monochrome: it was widely accepted that arresting those innocent men on the flimsiest of evidence was a win-win situation for all concerned. Equally obvious was the fact that the students themselves, their families and their communities were excluded from the particular calculus, for one obvious reason: they did not matter. A typical example could be found in an analytical piece in The Guardian on April 23 by Sandra Laville instructively titled ‘Police weigh red faces against atrocity’, the concluding sentence of which reads: “It is the police’s job to take decisions based on assessing risks. And more than any other agency they are likely to press for quick action in the knowledge that a few red faces are worth it if a bigger crime is averted”. It gets worse – in a piece addressing the issue of the ‘cost’ of wrongful arrests, there is zero mention of the cataclysmic impact on those arrested and their families. The writer had, in other words ‘correctly’ understood the inherent assumptions and the readers, as always, were expected to follow suit. Of course, anyone serious enough about discussing the consequences of such police incompetence could easily point out the extreme damage it causes to the communities they affect, often exacerbating the very dangers allegedly been combated. But again, this is too obvious a point for serious commentators to linger on. Unfortunately, until the politicised nature of anti-terror policing is expunged, innocent victims will continue to be arrested and immigration rules will continue to be used to clean up the resulting mess and, yes, to protect a few red faces. 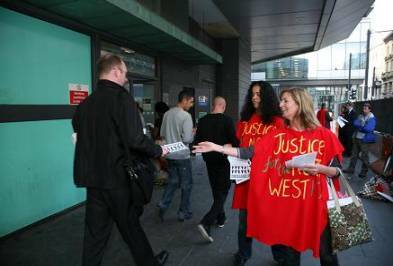 For more information on the ‘Justice for the North West 10’ campaign, click here. « Previous: The conspiracy conspiracy?